Clad in black blazers and formal shoes, a group of students and I crowded outside the Performance Hall on the evening of Jan. 17, waiting for the Women in Finance Panel Discussion to begin. Organized by Yale-NUS Student Investment Group (YNSIG), the conference attracted more than 60 attendees from universities and Junior Colleges in Singapore. While I was heartened to hear esteemed female leaders speak about the qualities women espouse that make them good leaders, it was also discouraging to hear that the struggle between career and family continues to exist. One of the most engaging topics for me was the discussion of qualities that female leaders bring to finance. 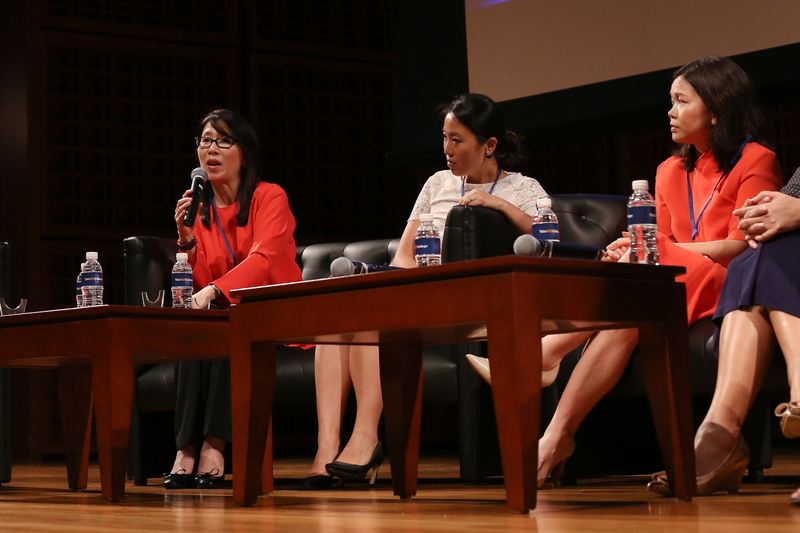 Verena Lim, Managing Director of Macquarie Infrastructure and Real Assets in Singapore, shared her personal experience of working with both male and female colleagues, pointing out the qualities women possess that are valued in the workplace. It is inspiring to see how traditionally feminine traits are now valued, when in the past, feminine traits like being emotional and passive were frowned upon. Speakers at the event included Verena Lim (Managing Director of Macquarie Bank in Singapore), Jiaying Gian (Executive Director of Commodities at Morgan Stanley), Lim Ming Ming (Senior Director and Head of Operations at Royal Banks of Canada in Singapore), Petra Freddi (Director of Milken Institute Asia), and Karen Loon (Partner of Assurance at PricewaterhouseCoopers). Today, women who are emotional are considered to have higher emotional intelligence, and are admired for being better able to inspire their subordinates. Lim also said that women are “[better at] reading situations” and “taking a step back when they perceive that clients are feeling uncomfortable [as opposed to men] who continue pushing”. While this can be interpreted as passivity, it can also be perceived as having a greater ability to consider the feelings of others. However, reconciling family and career remains a struggle for women. A stigma exists against women who sacrifice having a family for the sake of their career. It also exists for women who, conversely, sacrifice their career to set up a family. Women are thus trapped in a lose-lose situation: focusing on their career means being unable to fulfill their roles as mothers and caregivers, while focusing on their family means being labelled as unambitious. The average woman today is still forced to choose between family and career. Perhaps until Singapore implements paternity leave alongside maternity leave, the notion of men taking time off to help raise a child will still be considered unacceptable. Nonetheless, with more women entering this industry, which is a traditionally male-dominated field, there is hope that women will no longer have to carry the weight of this burden alone in the future.